Blade length : 65.4 cm or 25.75 i inches. Width at the hamachi :2.8 cm or 1.1nches. Width at the Kissaki : 2.24cm or 0.88 inches. Kasane : 0.64cm or 0.252inches. and thick with suitable sori and ookissaki style sword. Jigane :Itame hada and mokume had mixed with jinie and chikei work. and utsuri appear on the Ji. mist blade is bright and clear. and called Uemon. His work is suguha hamon with sakasa Ashi. Tsuba :On the square shape iron Tsuba, many deep line are engraved. or Baku is engraved with gold color. by Honami Koson at Showa 16th. 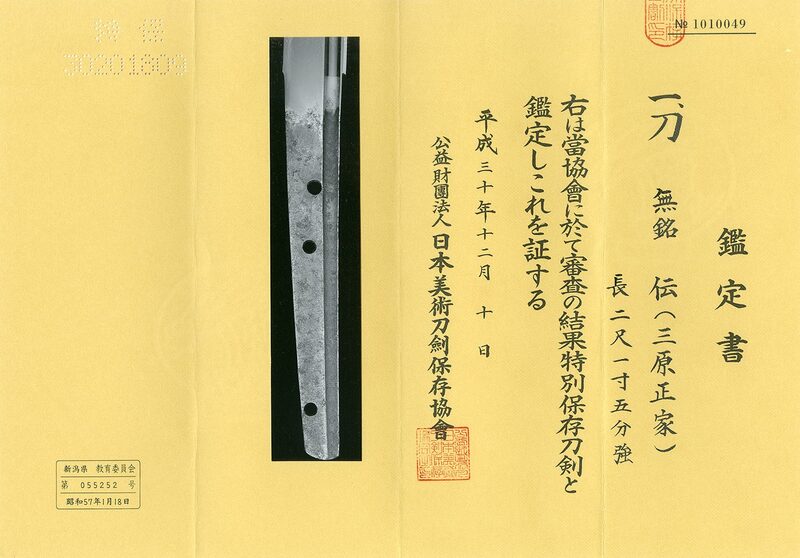 but NBTHK Judged as Mihara Masaie Koto blade. I think these answer are both right answer. The blade might be upgrade to Juyo Token. I think.